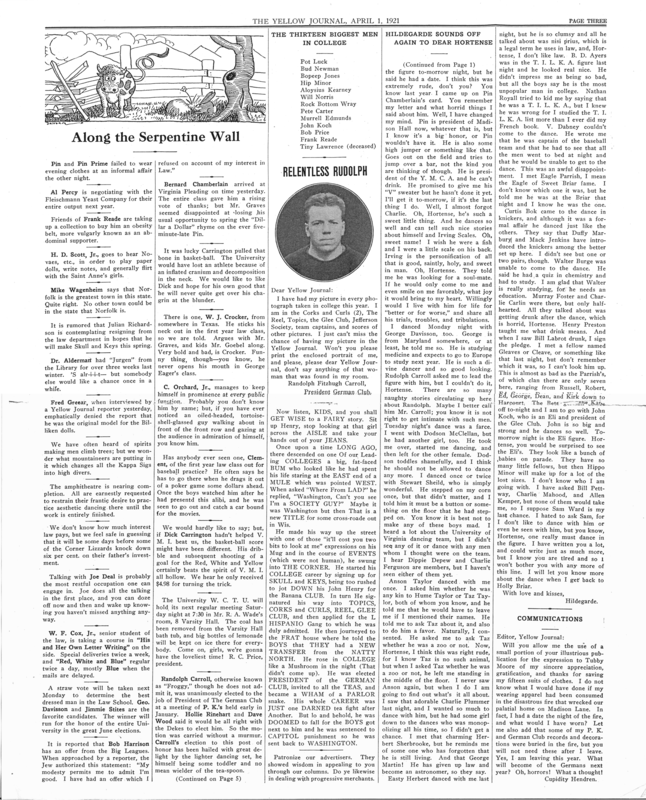 I’m gradually scanning and uploading the pages of the April 1921 Yellow Journal, that scurrilous anonymous satirical broadside at the University of Virginia. This morning I’ve uploaded pages 1 through 4 along with an index of the stories. The pages available through my site are 100dpi PNG files; TIFFs have also been produced. For now, these are scans of photocopies, as I’m reluctant to subject the fragile newsprint to my color scanner directly (mostly because every time I unfold it I run the risk of cracking the pages). I intend to get scans of the original artifact, but these black and white copies hopefully give some flavor of what the original is like.